awesome! i also imagine placing a few in some old french flower frogs! too cool! LOve this idea! Beautiful and functional! They look great in that cup love a bouquet! I’d love to feature this on my blog! Grey idea and I’m sure you will use them more now that you can see them! Very pretty. I’ve also seen something like this with a bobbin along with the thread to keep them together. If it’s anything like me, I can never find the bobbin (and I hate to wind new ones). Ummm, one question … what do you do when you want to actually use one … my luck it would be in the middle. Do you have thread spool stops on both ends? just go to insearchofitall.com and scroll down to in search of possibilities. That is super nifty and oh so colorful. It’s great putting items back to work. I’ll bet! It will be especially appreciated on the darker days. I love splashes of color. Thank you for sharing this thrifty idea. I love it! Pretty and functional as well as frugal and homemade….nothing could be better. They look lovely. So great when ordinary objects become art! So cool. I love this! I like that you can use thes as art in your sewing room. Andy Worhal made a tidy living photographing and painting everyday objects. what a clever idea. 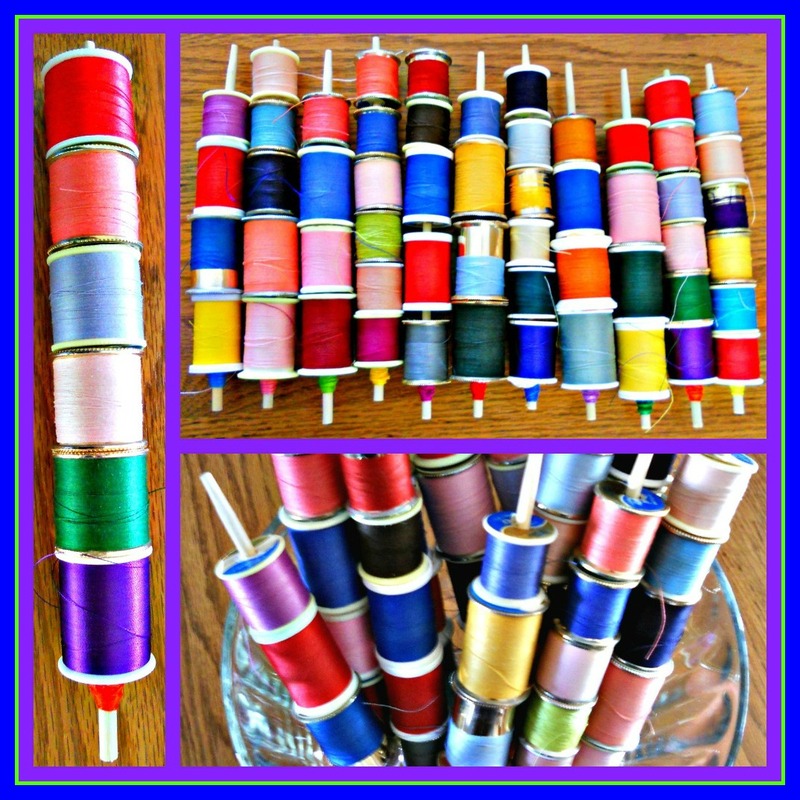 My Mom has like a million spools and she is always having a hard time finding the one she wants. I think its time i helped her organize her sewing items! thanks! That is so cool, I love it. Love this idea, but was a bit sad that I don’t have those sticks. Later I remembered hardware and craft stores sell dowels… bingo! Now I can make them, too! Thanks so much for all your gorgeous ideas!